Welcome and thanks for visiting Didier Walks, please allow me to introduce myself, my name is Didier Monot. In 2016 I completed a solo end-to-end of Western Australia’s Bibbulmun Track, our world class long distance trail. The “Bibb” is a 1000km (620 miles) journey from Kalamunda, a suburb in the hills east of Perth and ends in Albany on the south coast. The preparation and completing this personal challenge transformed me more than any other solo event in my life. As a result, I now wish to share this transformation with others who want to begin hiking, take their hiking to a new level or wish to use hiking as a tool to change their own life. I’m also finding that spending just a few days hiking with me or solo is offering others the direction they need to follow their own passion. 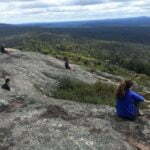 Didier Walks is a Perth based guided hiking, specialist Bibbulmun Track consulting and mentoring service. I have a passion for providing an authentic and professional experience for all of my clients. A Perth nature experience that most locals don’t even know is there! 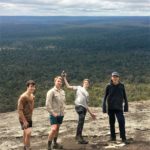 Completing the Bibbulmun Track end-to-end changed my life. I now offer my passion and experience to mentor you through your journey on the Bibb. It’s all based on simply showing up, walking, talking and evolving. Hiking can transform you physically, mentally and spiritually if you allow it. Physically by burning calories, making you stronger and in doing so creating new muscle memory that lasts. Mentally, the greatest gift long distance hiking gives you is the capacity to be present. Being present gives you the opportunity to start again, break old habits and furthermore replace them with new healthy behaviour. Spiritually you become one with everything around you. Whether it is a weekend hike for three generations of men from your family, hiking can bring your family together like nothing else. A young person will learn more about themselves on a three day hike than three months at home. Hiking, spending time in nature brings you back to where you are designed to be which is centred. Being centred assists you to take control of your mental wellbeing. I have had the amazing opportunity to travel in my life to beautiful locations. Both natural wonders and the biggest cities in the world. But it has always about how it made me feel, the experience over the destination. I am proud to be part of Western Australia’s tourism community. Offering visitors to my city of Perth an experience in Perth’s hills, hardly anyone knows it’s there. Please visit our Services page for more information or Contact us to discuss what we can offer you.